Be armed and ready for Easter with this adorable Treatsie crocheted bunny basket. It’s the perfect Easter egg hunt accessory! This crocheted bunny basket pattern is a wonderful project for beginners. Once finished, the crocheted bunny basket should be about 17 inches tall from the ears down to the base. Additionally, the finished product should have a circumference of approximately 31 inches. In metric measurements, the completed Treatsie the Bunny basket should have a height of around 43 cm including the ears and should measure about 78.5 cm around. This fun and awesome Treatsie bunny basket is a design by Tracee Fromm. In fact, you can access the FREE downloadable pattern for this adorable crocheted bunny basket on her website. 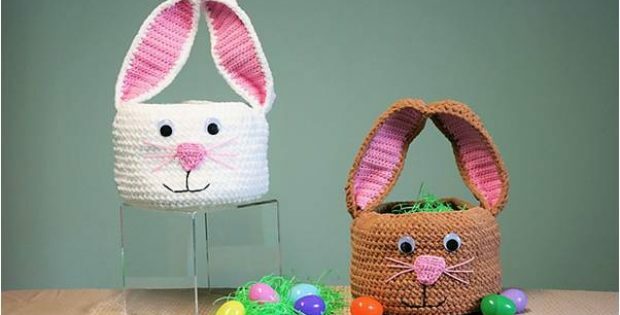 To access the FREE downloadable pattern for this fun crocheted basket, please click on this link: Treatsie The Bunny Basket Pattern. Featured image: Tracee Fromm (Fromm Me To You) – thank you!